The introduction of the CycloneTM marks a foray into an entirely new product category – perhaps better described as “Fire Art” than a conventional fireplace. The Cyclone is available in either a customizable version or as a system. 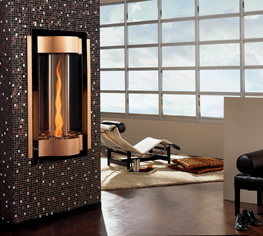 Both models feature the same mesmerizing, show-stopping, spinning tower of fire available only from Heat & Glo. Only 15,000 BTUs, the Cyclone offers a comfortable level of heat for installation in smaller areas, such as foyers and hallways, or in public areas like a lobby, bar or showroom. The Cyclone System includes everything you’ll need for installation with the exception of the vent pipe. The package includes the Cyclone, a decorative front in either Brushed Nickel/Black Nickel or Brushed Copper/Black Copper, a decorative base material and an RC-Smart remote control.